Now that we’re at daycare proportions in family members, the kids and I have switched to self-directed, self-led fun. I’m trying to say, “yes” more and they’re coming up with many ideas to entertain themselves that don’t require electricity. 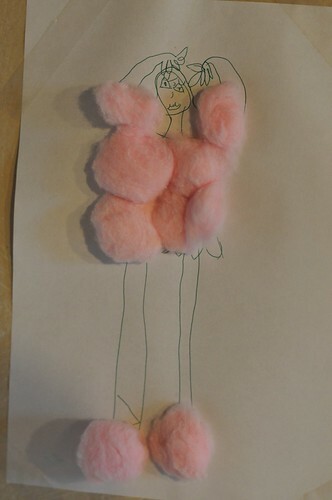 Lucy, who was home sick for the day, was sewing a doll and needed stuffing. She ran upstairs and grabbed a handful of cotton balls. 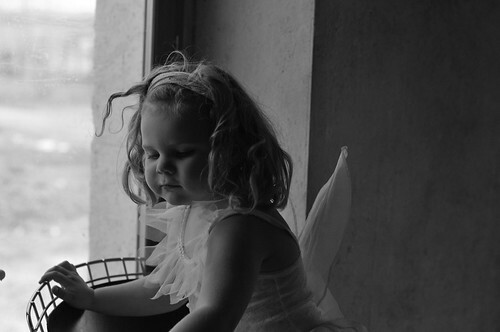 The doll was a huge flop as she’s not schooled in the magic tricks of sewing yet. 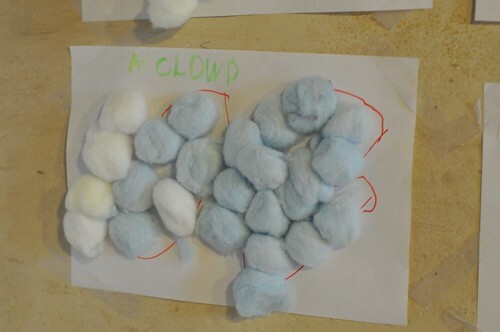 But, not discouraged, she decided to make art with cotton balls. The creations were only limited by the finite number of available cotton balls. 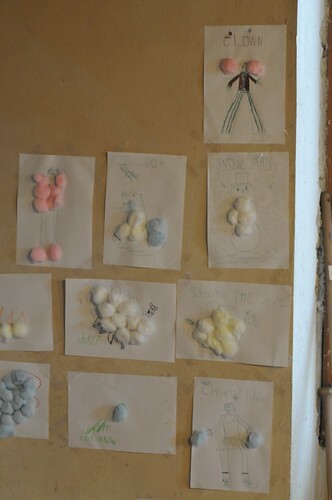 When Otto and Minty came home from school, they quickly felt the cotton ball art urge and jumped into their imagination to produce many fluffy creations. All the pieces were put up on the wall that the kids dubbed a place for their art. Some of my favorites were Minty’s “A Clowd ” and Lucy’s “Ballerina.” But by far, Otto once again stole my heart with “Cottinbow.” Cottinbow, for me, said so much and visually provided so little. 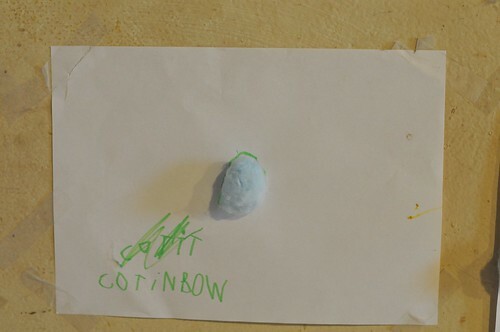 Sadly, in a panicked attempt to create “Blue Dog,” Cottinbow was destroyed as Otto gathered all the blue cotton balls. C’est dommage. Sometimes art has a short life yet lives forever in your memories. 1. Ken’s head has been recovered. 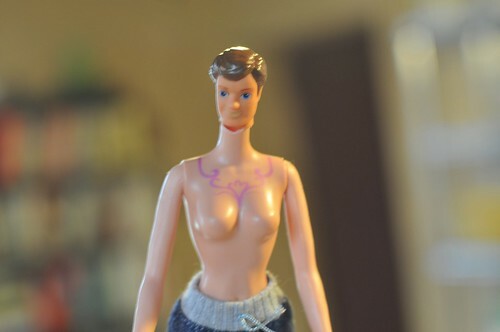 It was a long and scary journey for poor Ken, but his head was found by Otto in the bottom of a dark and forgotten Barbie bin of long ago. And it appears he’s been up to something. He’s a new man … er or something. 2. 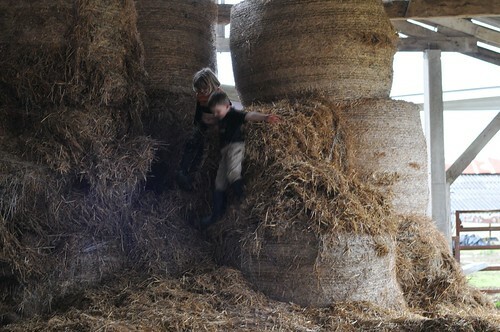 A large pile of Straw is fun! Let’s not get so caught up in the daily commute with meetings offering breaks for a quick trip to the local for a latte. 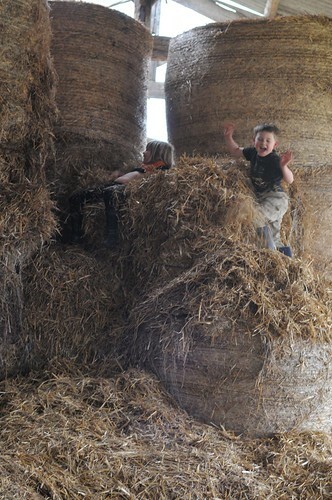 Remember a giant, mile-high stack of straw is not only fun, but entertainment for hours and hours. 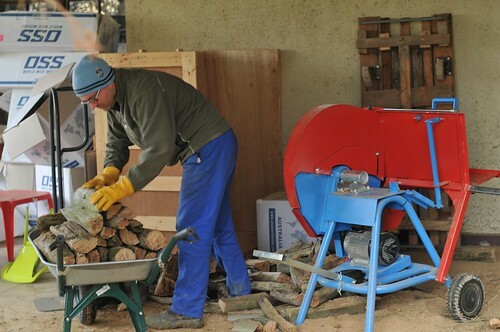 … and for Kevin, a full picture of “Bruce” the circular saw. This is not the first time a guy has knocked on our door holding a bag o’ meat in a trash bag*. 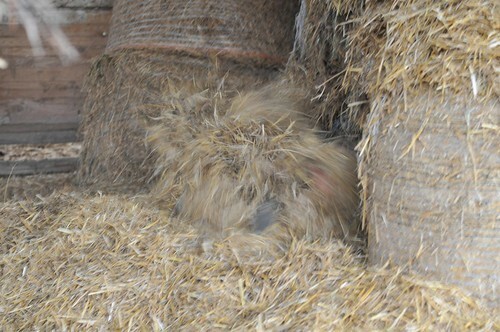 The first time was our previous renter who happened across a wild boar with his car. Essentially, he offered us roadkill. Sanglier is more than roadkill however, it’s actually VERY good. Brent cooked it up good in a winter stew that apparently was very delicious. I, eight months pregnant, did not want to risk illness on a stranger’s mystery meat. This night’s call was from the local hunters. 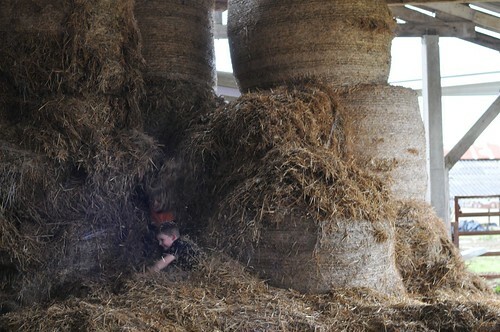 In early October, they asked us if they could do “the hunt” through our paddocks. He told us the days they release the birds and what days they would be going through. We said, no problem. 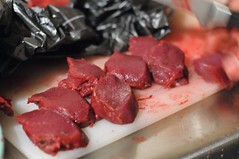 So months later, as a thank you, one of the hunting club members dropped by a chunk of freshly shot venison (yes, he shot Bambi). 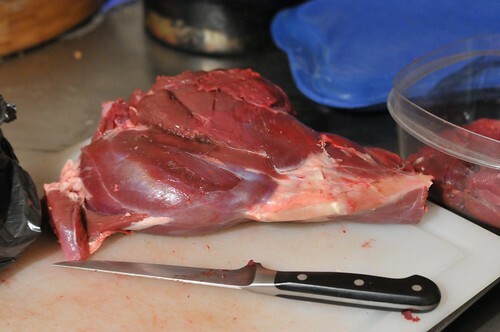 Venison is not something that’s easy to buy. 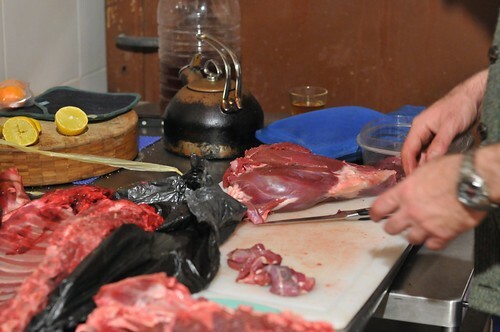 You have to know a hunter or go to a restaurant to enjoy. The meat was so fresh. Brent had to carve it right away. 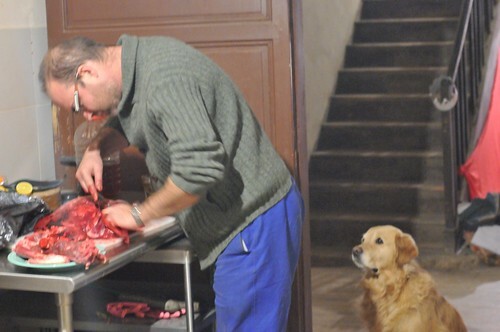 Tosca looked on while using her Retriever Mind Tricks™ to get Brent to drop some Bambi meat. Her breed has been described as “a stomach with four legs fastened to each corner” (thanks for that, Robert!). These powers are strong with this one. After all the carving, Brent did a quick sear of the tenderloin with butter, salt and pepper. It was so tender, so flavorful and not at all “gamey.” This is my second time eating Bambi and let me tell you, if lovin’ Bambi meat is wrong, GIRL I don’t wanna be rightah. 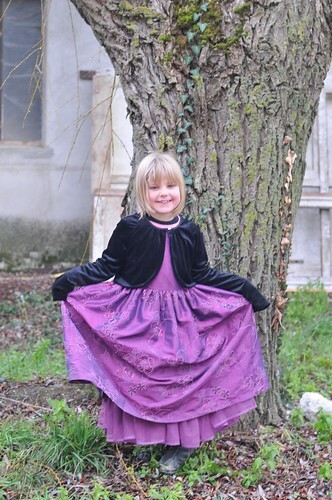 … ahem,and for the vegetarian audience here’s Lucy in her new pretty dress! * “Glad Bag” means “trash bag” or “bin bag.” I believe it’s my southern Californian upbringing that taught me to refer to everyday products by their brand name (see also Scott Towel, Kleenex, Q-Tip and Coke … as in What kind of Coke do you want?). Okay, cold is a relative term. (oh yes and happy new year!) It’s not “Chicago” cold, but very, very cold, which is only exaggerated by the lack of central heating. We now have two wood burning fires thanks to Brent’s well directed efforts. Mr. Green and our newest edition “Fremont” keep us nice and toasty as long as we’re in the room. Getting out of bed or cooking dinner requires suiting up for the brisk single digit atmosphere. Little Fremont earned its name from the gorgeous topographical rendition of Billy Goats Gruff and the troll that lives under the bridge. Our house in Seattle was near a similar troll that lived under the Aurora Bridge in Fremont. 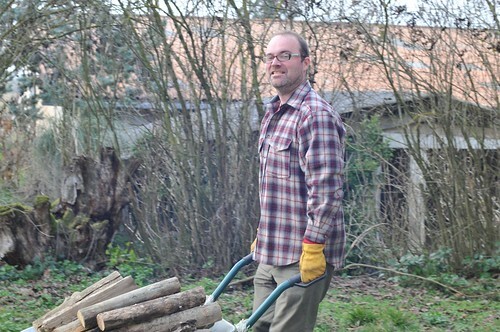 Mr. Green and Fremont are fueled with perfectly cut posts by the newest power tool in the family, the circular saw. 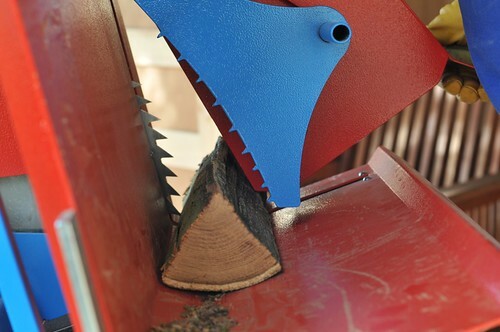 Before this beauty of a machine was adopted, Brent cut posts with Alice the chainsaw. This was horrible work for poor Alice and a slow operation for Brent and Michael who executed the wood chopping. The circular saw as of yet is nameless. The speed and efficiency it gains us is priceless. Aside from the Great Advent Debacle of 2010, the kids have been dealing with the cold quite well (let’s just say a certain three-year-old left alone with everyone’s sweet Christmas tracking tool, could take it no longer. Starting with day 12, all chocolates behind all dated doors in everyone’s calendar were eaten). Ugg boots have never been so precious. Hats, gloves, scarves and coats have never been so well accounted for. We now know that hot water bottles – those rubbery things filled with hot water that grandma used to use – are alive and well and living in France. My centrally heated American attitude had like, totally thought these things were a thing of the past. Other quaint things with an actual purpose are dressing gowns, slippers and thermal underwear. 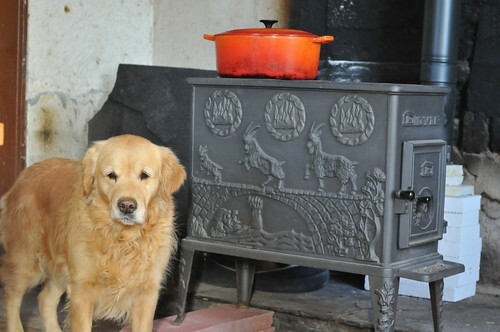 Items that are not simply Christmas presents for Dad, in these cold Gascon houses, they are a necessity.